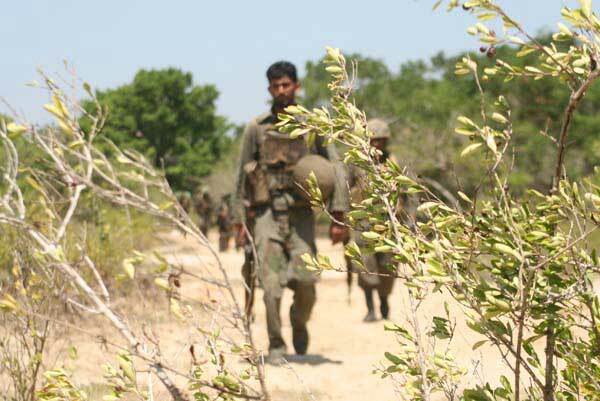 Sri Lankan government forces on foot patrol. Nearly a year after the Security Forces killed Prabhakaran and finished the decades long conflict, the Government continues to be haunted by allegations of war crimes. Navi Pillay, the UN High Commissioner for Human Rights, has called for an international investigation on many occasions. Last week, as she repeated this message on presenting her annual report in Geneva, she was joined by a rather more influential figure – the UN Secretary General. Ban Ki-moon has now appointed an expert panel to advise him on ‘accountability issues’ in Sri Lanka. This is one of the first really meaningful steps to be taken by an official body. And it won’t be the last. The Government invariably responds to such pressure by declaring that those applying it must have ulterior motives. If they are lucky, they are only accused of grubbing for votes. Or they are said to have sour grapes about some petty incident or other. Their advice wasn’t heeded, perhaps. The range of implausible explanations has become quite vast over time. Most are claimed to be actively working towards the resurrection of the LTTE. Fascinatingly complex reasons for this are then suggested. It is sometimes true. But the actions of Ban Ki-moon should alert people to the fact that there is something more going on here. We need to understand why an official of his standing feels compelled to look into the situation in Sri Lanka, despite the country finally being at peace. This is what prompted me to request an interview with Professor Francois Houtart, chair of the largely-ignored Dublin Tribunal. His team found the Government guilty of war crimes at a three day session held at Trinity College in January this year. There are plenty of reasons to question their conclusions. The report is almost completely lacking in details, and the supporting evidence that the authors say can be found on their website has not been uploaded yet, two months after proceedings closed. Professor Houtart explained that they could produce only a summary of their findings for publication because the documentation submitted was so vast and the organisation responsible for compiling it had limited resources and worked on a purely voluntary basis. The information was available in Rome for anybody to consult, he told me over the phone from his office in Belgium. This may be fair enough, but it makes assessing the validity of the document rather tricky. Worse, there are some glaring errors. The document opens with a particularly bad one. It says, ‘From the time the war began in July 2006 through April 2009, according to United Nations internal documents, air raids and the use of heavy weaponry resulted in the death of 116 people per day.’ This implies that about 120,000 people were killed under the watch of Mahinda Rajapaksa, not counting victims of the LTTE and those who succumbed to small arms, mines and due to sickness or the lack of proper food and water, which Professor Houtart acknowledged on questioning was ridiculous. It is more like the total number of dead in 30 years. 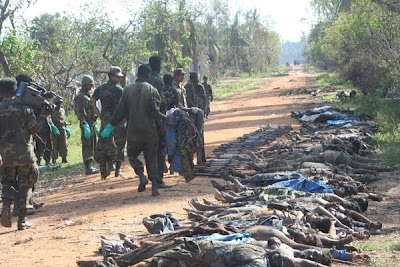 Everybody in Sri Lanka knows that the United Nations estimate refers to the final stages of the war and that an extrapolation of this was the basis for the claim made by The Times and then repeated by other media groups that 20,000 people died. That the authors didn’t spot this very obvious discrepancy in their complaint against the Government doesn’t exactly inspire confidence in their ability to carefully review information and reach sensible conclusions. Nevertheless, there is no getting away from the fact that a group of eminent intellectuals have come to believe that the Government was responsible for war crimes. Professor Houtart is totally convinced, and his opinion should be respected. He is an internationally recognised figure, having been involved in social work all his life. His links, particularly with progressive leaders in Latin America, are formidable. Last year, he won the UNESCO Prize for the Promotion of Tolerance and Non-Violence. He is also no stranger to Sri Lanka. I met him in Colombo some five years ago, but he has been visiting at regular intervals from the 1960s. He did his PhD thesis on Buddhism here. The Dublin Tribunal is one of many in which he has participated. His involvement in such work dates back several decades, to the effort organised by Bertrand Russell and Jean Paul Sartre to question American foreign policy and military intervention in Vietnam. Professor Houtart has chaired a number of sessions, including one on the Iraq War that condemned the United States in the harshest of terms. He isn’t biased. Nor is he a fool. Whether or not he is right about why the Ceasefire Agreement broke down and what was subsequently done to beat the LTTE can’t be cleared up in the space of this column. But in the course of discussing his interpretation of the facts, he made an important point. The primary concern in Sri Lanka must now be reconciliation. This is what motivated Professor Houtart to accept the invitation to chair the Dublin Tribunal. As he told me, experience shows that if the truth is not recognised, it is impossible for a country to move forward. The repercussions may not be felt at once, he said, but they will come. A genuine process of reconciliation will emerge only if people can reach a common understanding of what happened during the war. It is blindingly obvious that there is no such consensus to date. The vast majority of Sinhalese believe something quite different to most Tamils. The same is true in the diaspora, I might add, or actually to a far greater extent. How those who supported the LTTE are to be persuaded to give up their struggle for Eelam if no efforts are made to bring them into a serious dialogue, I am really not sure. They present the most imminent danger to the country as things stand, considering the funds and networks to which they have access. My suggestion to Professor Houtart was that to insist on an approach that might lead to prosecutions was to close off all possibility of debate in Sri Lanka. The sense of relief and gratitude towards the Security Forces for finishing off such an old and all-consuming problem is just too widespread and strong for that to be allowed. The more people in Colombo and other parts of the country that were insulated from the full impact of the conflict feel they are being pushed towards legal action, the less willing they will be to consider whether the narrative they have come to accept regarding the final stages of the war is the whole truth. We then remain stuck in talk of a humanitarian rescue mission, surgical strikes and a zero casualty policy, phrases that can only anger those who lost relatives in the Vanni. The Government clearly isn’t going to be forced into doing anything other than settling scores with Sarath Fonseka in any case. Professor Houtart disagreed, saying that the law couldn't be ignored. He said that to do so would jeopardise what he called the 'whole social fabric', adding that pardons could still be issued afterwards. This is worth further consideration. Remains of Tamil Tiger fighters displayed to the media after the fall of the Tigers' stronghold in May 2009. It seems to me to be the key to dealing with allegations of war crimes. Indeed, the interview as a whole reinforced my feeling that Sri Lanka must now look back at the last three decades and try to understand where mistakes were made and why, in order to ensure that they can never be repeated. Enough time has passed. The country is secure. Mahinda Rajapaksa is about to consolidate his success in the presidential election with another poll victory. Once the UPFA returns him a majority in Parliament, he will have run out of excuses to act on reconciliation and all the other issues he has been avoiding in the past ten months. Ban Ki-moon probably doesn't want anything more than such a process of reflection, assuming it is sincerely undertaken. Getting started would therefore be an excellent way of shoring up relationships with the international community. We should remember that it was never only Western nations who were concerned about human rights violations and a political solution for minorities. Nobody should mistake this as a call to bow down and capitulate to the demands of Navi Pillay or whoever else. It is just a happy coincidence that doing what is best for Sri Lanka will also help in dealing with institutions like the UN. This article first appeared on The Island and it has been reprinted here with permission from it's editor.